Have you thought about making fudge but were intimidated? Maybe you’ve tried making fudge, but it didn’t turn out right? 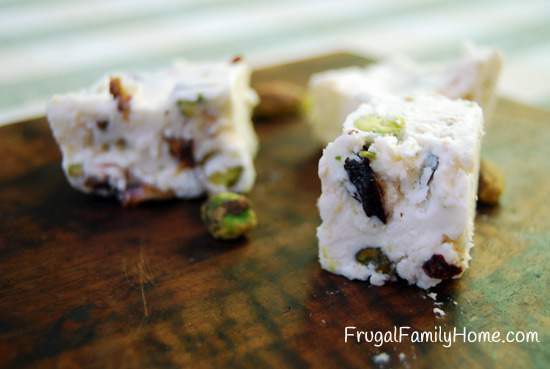 Well, this easy cherry pistachio fudge recipe is foolproof. 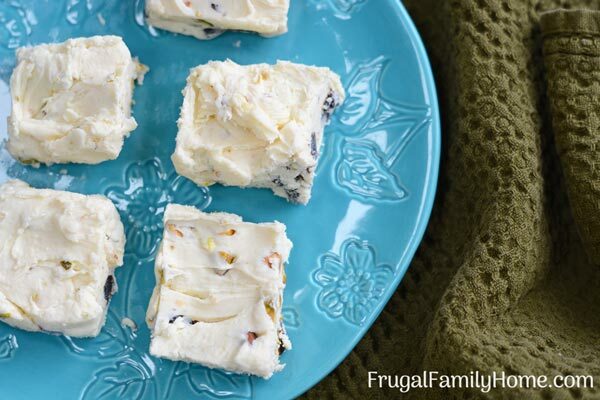 If you can run a microwave, you can make this fudge! Now I know you might think, foolproof, yeah right. You’ve tried to make fudge, and it didn’t set up. Or maybe it was so hard when you tried to cut it, it crumbled into a million pieces. I hear you. I’ve had traditionally made fudge turn out that way for me too. 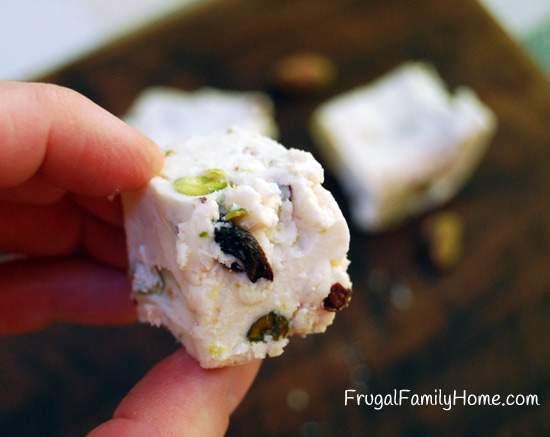 That’s why this cherry pistachio fudge is so great, you don’t have to worry about getting it to the right temperature. It’s a frosting fudge recipe. What’s a Frosting Fudge Recipe? Instead of boiling the sugar and milk together to the right temperature and then adding the chips, you skip that and use a can of frosting instead. There’s no candy thermometer, no watching to make sure you are at the right temperature. It’s a quick heat the chips, stir in the ingredients and let it set up. That’s it, so simple and easy. Even though this recipe is simple to make, it’s nice to see it made especially if you’ve had problems with fudge recipes in the past. 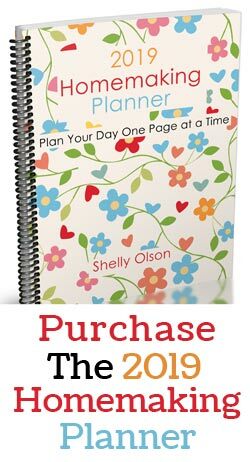 Watch each step in the recipe video and then scroll down to get the printable recipe and make a batch for yourself. When melting the chips microwave at 30-second intervals, then stir. Then microwave again for 30 seconds and repeat the process until the chips are melted and smooth. If you microwave the chips too long without stirring, they can overheat and get grainy. Once that has happened there is no saving them. Trust me, I’ve tried. Take the time to microwave and stir. You can also you a pan on the stove top over low to medium low heat to melt the chips. Stir constantly to keep parts of the chips from overheating. Once all the chips are melted remove from the store and stir in the remaining ingredients. This recipe sets up pretty quickly, making it perfect for a last minute dish to take to a party. But that can work against you too. 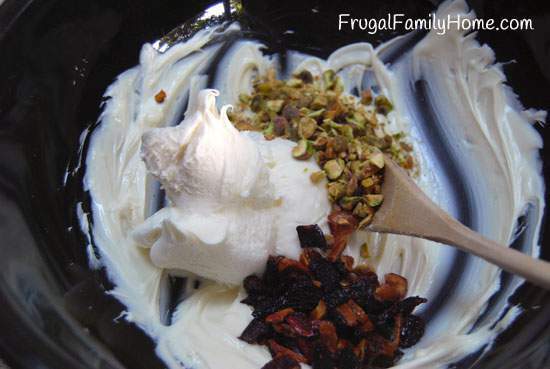 If you heat the chips and let them sit while you chop the cherries and pistachios, the fudge won’t mix well. The chips will harden. And then you will have a hard time mixing the other ingredients together. Instead prepare all the ingredients before you heat the chips. Take the frosting out of the can and place it into a bowl. This will eliminate the stress of trying to quickly get the frosting out. It’s much easier to scoop it out of a bowl than to pry it out of that can. Once the frosting is in the bowl and out of the can chop the cherries and nuts. I like to cut the dried cherries in half. I’ve run into big cherries when trying to cut the fudge and they don’t cut well. It’s better to cut them in half or if they are big into quarters before mixing them in. The pistachios are hard to cut in the fudge; they tend to move instead of cutting. Instead of dealing with that, rough cut your pistachios before adding them. It makes it much easier to cut the set up fudge. If you want thicker fudge pieces, use a 9-inch square baking dish. If you want thinner pieces of fudge, you can spread it thinner into a 9 by 13 inch pan to cool. It all depends on if you like thicker smaller pieces of fudge or bigger thinner pieces. The fudge will set up sitting on the counter. But if you are in a hurry, read in you forgot you needed to bring something to a party, you can place the fudge in the refrigerator to help it set up more quickly. You can store this fudge at room temperature or in the refrigerator. I find if it will be consumed quickly, room temperature in a covered container is good. 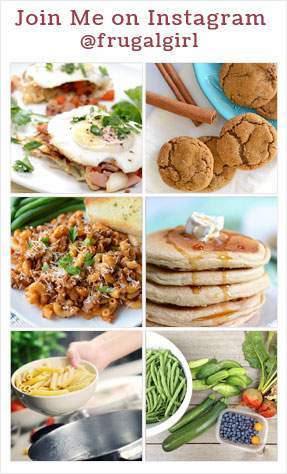 If you won’t be consuming it quickly store it in the refrigerator in a covered container is best. An easy fudge recipe that only takes 5 ingredients and a few minutes to prepare. In a microwave-safe bowl, microwave the vanilla chips for one minute and then stir. Repeat until the vanilla chips are melted and smooth. Stir in the frosting into the melted chips with the cherry candy flavoring. Then stir in the cherries and pistachios. Spread into a greased 9-inch square pan or 9 by 13-inch pan depending on the thickness you desire. Once the fudge is set, cut into serving sized pieces and enjoy. If you want your fudge to be pink in color you can add a few drops of red food coloring or use cherry frosting instead of vanilla. 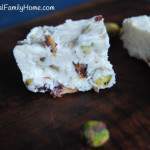 With an easy fudge recipe like this cherry pistachio fudge recipe you can be confident in your abilities to make fudge your family and friends will rave about. Without having to worry if it will turn out or not. See more posts in this series on the 31 Days of Homemade Sweet Treats page. 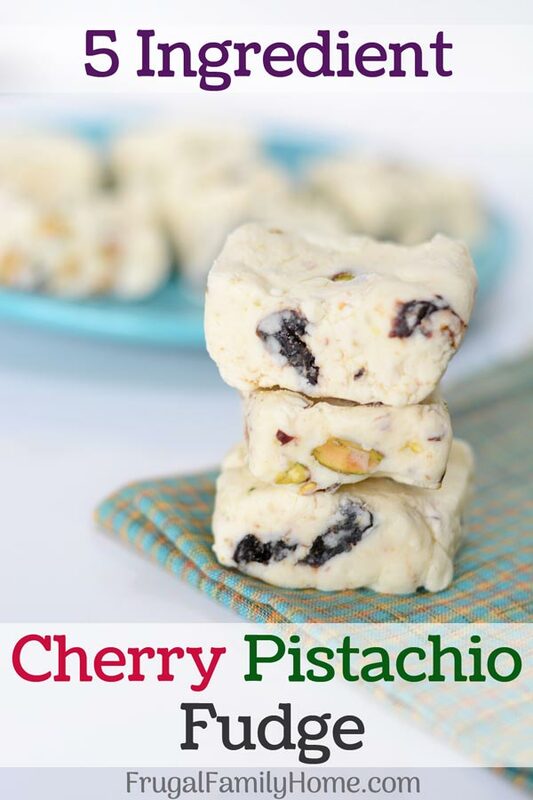 Cherry and pistachio sounds like a really yummy combination..can’t wait to try it!